One of the surprising things about HLD theory is that it predicts the optimum situation for separating oil from water in, say, oil recovery or biodiesel production. The right thing to do is add a surfactant that brings the HLD of the system to 0. This fact is very liberating. You take your oil/water/other-stuff system, make an intelligent estimate of where it is in HLD space and do a scan with plausible surfactants to find the HLD=0 point. You now know how to get the best separation. It seems non-intuitive that to separate oil out of an oil-in-water emulsion one excellent strategy is to add a surfactant. Of course adding the wrong surfactant could make matters worse and add foaming to an already bad situation. Yet the quickest way for the oil to get together with other drops of oil and to cream to the surface is for there to be no oil/water/oil barrier, in other words, the interfacial tension should be low, which means in turn that HLD=0. This means of course that the temperature, salinity and EACN of the oil have to be known and, if other surfactants happen to be present, what the likely HLD currently is so to allow an estimate of how much counter-surfactant would be required to fix the problem. This is perhaps best done via a scan adding a known surfactant till the Type III phase is spotted. As with EOR, Cosmetics and Cleaning, the efficiency of the system depends strongly on the surfactant parameters such as MWt, Head Area A, Tail Length L and the ξ parameter. 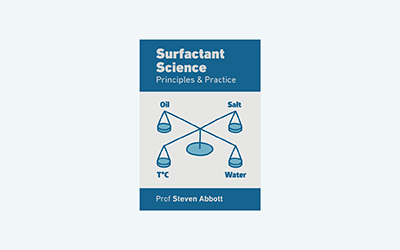 It is unlikely that any single surfactant will give you exactly what you want. But once you know the ideal Cc value, you can use the Cc blending calculator in the Essentials section to find a good balance. This nice picture is complicated by two different considerations. For crude oil which contains its own surfactant system (asphaltenes) you often don't know the exact Cc, but you experimentally get a similar plot by varying the concentration of the known surfactant, i.e. doing a Cc scan. Also the asphaltenes are complex and at times adding more of the right surfactant leads to a complicated interfacial behaviour which reduces the elastic barrier properties of the asphaltenes and speeds up separation. See Patrick Bouriat, Miguel Rondon, Jean Lachaise,and Jean-Louis Salager, Correlation between Interfacial Tension Bump and Optimal Crude Oil Dehydration, Energy & Fuels 2009, 23, 3998–4002. The diagram works only for 50:50 O:W. The FishTail plot in tells us that the optimum Cc can shift dramatically as the O:W ratio changes. As is often pointed out, at HLD=0 things are simple for O:W ratios from 30:70 to 70:30 but outside that zone it is very easy to fall into W:O:W or O:W:O emulsions which are a cataclysm in terms of separation. The FishTail plot tells you how to avoid that danger. A lot of fascinating data which could probably be well-analysed via the FishTail plot is in Belsay Borges, Miguel Rondon, Onelys Sereno, and Juan Asuaje, Breaking of Water-in-Crude-Oil Emulsions. 3. Influence of Salinity and Water-Oil Ratio on Demulsifier Action, Energy & Fuels 2009, 23, 1568–1574.